Excitement is building for the new 2020 Jaguar models with the announcement of the bold new 2020 Jaguar XE. The 2020 Jaguar XE is a full refresh of the popular sedan and offers a sporty luxury vehicle that owners will adore. New exterior design details, a plush new interior, and vast infotainment options adorn the fresh new Jaguar XE. The stunning new Jaguar XE for 2020 also delivers some of the best driver assistance features to keep your family safe on busy roadways. Jaguar has redesigned the Jaguar XE with bold and sporty exterior elements that make it truly unique. The front of the luxury sedan features slimmer LED headlights, delivering a sporty look. A stunning new mesh-style grille gives the 2020 Jaguar XE a lot of character. The rear of the car will feature LED taillights and a freshly-designed new bumper and valance. Continuing with the sporty design, 18-inch wheels come standard on all Jaguar XE trim levels for 2020. The powertrain matches nicely to support the aggressive exterior design. Two Igenium turbocharged gasoline four-cylinder engines are available for 2020, a 247-horsepower version and a 296-horsepower version. The 296-horsepower (P300) delivers power to a standard all-wheel drive system for excellent traction in any road conditions. The 247-horsepower model is standard rear wheel drive, with the option of upgrading to the all-wheel drive system. Both powerful engines deliver excellent acceleration with the help of an efficient 8-speed automatic transmission. The new passenger cabin of the 2020 Jaguar XE features rich premium materials and high-quality veneers. Jaguar engineers have enhanced every aspect of the interior to ensure passenger comfort, improve storage features, and improve overall convenience. Every trim level of the luxurious new Jaguar XE features leather upholstery with embossed headrests, Jaguar seat labeling, and twin needle stitching details. An all-new door design features wider interior door handles, offering more space for large drink bottles in the lower storage areas. The 2020 Jaguar XE has a handy SportShift gear selector, eliminating the previous models rotary control gear selector. A new optional InControl Touch™ Pro Duo infotainment system includes a 12.3-inch touchscreen display, allowing you to customize your driving experience at the touch of a finger. All these features, and more, offer drivers and passenger an ultimate luxury experience. Safety is important when transporting your family. The 2020 Jaguar XE comes standard with world class safety features including Lane Keep Assist, front and rear parking aids, a driver condition monitor, and a rear view camera. Additional safety features are available including a convenient Head-up Display, a ClearSight Rear View Mirror, Park Assist, Blind Spot Assist, High-Speed Brake Assist, Traffic Sign Recognition, and much more. Drive with confidence with a whole suite of customizable safety options available for the 2020 Jaguar XE. 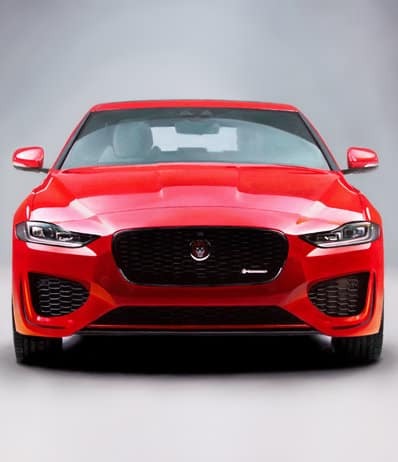 Jaguar Colorado Springs is ready to assist you with your order of a sporty new 2020 Jaguar XE sedan. Contact our sales experts for more information on the many features available on this amazing re-designed Jaguar!